Last night, I stayed up until nearly dawn writing a report that was 5 times longer than I’d originally envised it, detailing Harry’s… quirks… for his new nursery staff at School Fabulous (© May). I’m hoping his more adorable qualities will become self-evident to them, because I haven’t had space to talk about those. It’s… kinda long. John and I took him to meet the staff there today (he banged his head three times in 30 minutes). There are four nursery staff, and currently only 3 other children doing afternoon sessions, one of whom we already know. It is, you will not be surprised to hear, a special school, catering for children aged 2 to 19, all of whom have special educational needs. School Fabulous is a pretty cool place. Sensory garden, light room, soft play centre, hydrotherapy pool, huge indoor sand pit, areas for every type of play I can think of, and a playground strewn with Exciting Stuff. There are speech therapists, physiotherapists, nurses and nursing assistants, all visiting on-site. The school is well-known throughout our county, as… THE special school. How can I put this? There’s a lot of parking for wheelchairs. There’s lots of kids wearing head protectors. When I tell friends who haven’t heard about Harry’s lack of speech that he is starting there, they all look mildly horrified and blurt out a variation on ‘Why, what’s wrong with him?’ before hastily re-modelling their faces into Kind Concern and I’mSureHe’llComeOnVeryWell fervent nodding. What I feel about that generally depends on how much I like the friend. What I feel about his admission, following a panel meeting, is huge, profound relief. I sat and wept writing my long, pitifully long list of the things that Harry does that, taken as a whole, make him such a challenge to parent. I’d never held the collective weight of every single one of our difficulties in my mind before then, and I’d not realised quite how many minor troubling issues I had been hoping he would grow out of. Whih is absurd, really, because Harry is making very discernable progress, if not in his actual speech, then certainly in his communication. Either his comprehension of our speech has taken a leap forward, or his newly-acquired skill of nodding has motivated him to integrate with us more – perhaps both. This morning, on a whim, I asked him to say the word ‘Tesco’ (Yeah, yeah, I know. Of all the words to pick. We were outside!). And he tried! He’s never mimicked a sound on request in his entire life. I think he either hasn’t hitherto understood what ‘say’ (i.e. ‘Harry say it’) meant, or his brain just can’t retrieve and reproduce memorised speech-sounds accurately yet. Again, probably both. I’d most likely have had no luck had I asked him to mimic any sound except T or D, which letters begin most of his babble, but he definitely sat there having a go at repeating ‘Te…Te…Te’ after me. I floated into the shop. Which was some achievement considering the scales registered an all-time personal worst for me this morning – why, yes, that does include pregnancy OMFGlalalalaHalpHalpHalplookattheprettyweather. Looking on the bright side (I will, consequently, have to move out of the way of the GODDAMNED SUN) I have re-joined my old gym, and will shortly be gymming and swimming Tuesday, Wednesday and Thursday afternoons while Harry is in his new nursery, just around the corner. My health, sadly, desperately needs these 7.5 hours a week devoted to improving its host. I am planning to keep him at our local mainstream nursery on Friday mornings, and extend his session over lunchtime. We will be financially better off all-told, as his new nursery place is fully funded on account of his specific need, and I will be paid a mileage allowance for taking him there. Which brings me to the only part of this that makes me really bite my lip and think about the whole Holland thing again. I don’t have to take him myself if I don’t want to: Harry is entitled to free transport there and back, as it is a needs-based placement. Although I would not even remotely consider the option at present, the school would arrange to deliver him door to door. 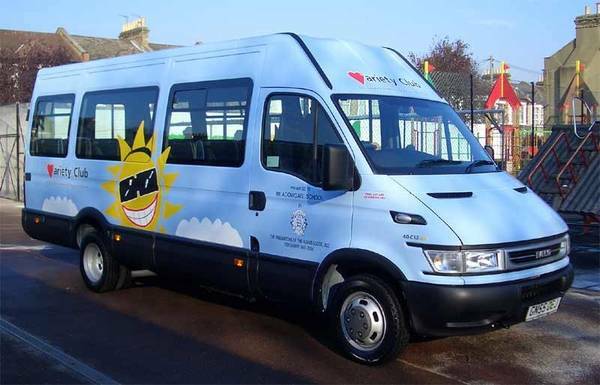 In their – short – Sunshine bus. Use the bus. Really. I mean, I know, I KNOW, what it Stands For to you, etc. but honestly, any bit of help you can get, take it. Oh, I would if he was older! Having said that, I’m a bit paranoid about his safety – I never wave him off in a car with John without mentally crossing myself – so I’d be a bit worried about theOtto factor, I s’pose. Just tried to read your report-thingy, but it wasn’t there. Did you take it down? Just curious. Also BRILLIANT on the mimicry on request! Have you considered that he might have Apraxia? I have a good friend whose little boy has that and some of Harry’s…quirks…remind me of the stuff she’s related. I can put you in touch if you like? Oh! I can see it! WTF have I done to it?! See, I’m not the only one who thinks he has dyspraxia (apraxia is for adults who’ve had strokes). I’m pretty much of the the opinion that If he doesn’t have cerebral palsy, then he deffo has dyspraxia. The (almost certain) hypoxia he suffered in utero inclines me in favour of the former, but the latter diagnosis does suit him awfully, awfully well, too. Better, in ways, as he doesn’t have the bodily exhaustion often associated with hypotonia. At least I’ve got over my OMFG HE ALSO HAS AUTISM! wobble. May talked me down from the ledge, bless her. I think the US term dyspraxia ‘Apraxia of speech’? Wow. Your report was very informative. Excellent work, my dear. I have high hopes for School Fabulous. Oh Anne, I’m so happy you found a school for Harry to go to that will take such good care of him. I’m still working on getting Zeke into one as well. Our system offers a free door-to-door bus service as well, but I’m not to keen on it either. I think 4 is still too young for that sort of thing. And with Harry being even younger, I am with you on driving him yourself (especially if the gym is right around the corner). And, yay for mimicry! To some it may not seem like a lot, but I get what a huge step it is. Way to go Harry! I think I’d be reluctant to put him on the bus as well, just because of his propensity for falling. I’m quite shocked regarding the cavalier behaviour of the medical profession towards him. An urgent faxed referral for psychological assessment and MRI, but the notes are still sat on his Consultant’s desk and his referral paperwork to CAMHS was lost? That’s horrendous! I am so happy, though, that you’ve managed to get him into such a wonderful school. It’s certainly going to help him develop by leaps and bounds. You definitely need some time for you – gym, swim, coffee, cake whatever – so I would definitely bypass the bus for now. So pleased though that things are moving forward. It must be so distressing for you, Wifey – all these unknowns and inponderables. So much is mysterious. So hard not to be fearful. But Harry is making good progress, he is, hang on to that, and you are giving him the best possible opportunities to continue to. I mightily wish you three the very very best. (Gym/swim/quiet time? Lovely! Good on you). It must be an upset and a relief about having to explore areas such as Fabulous school, but I think he will be well looked after and get the attention he needs. AND I am really heartened and hopeful about the steps of progress he has been making recently…keep it up H!